Basically what the question says, what are the pro's and cons to using InDesign, Illustrator, or Photoshop for business cards? Or is there something else you prefer to use? In theory, any of those (plus others you haven't mentioned, like the open source alternatives Gimp and Inkscape) let you design a business card. If you are particularly proficient with one of them, you might want to consider going for that one to save time. While the three Adobe products have some similarities of use, they all require some learning time. If you have the time, I'd definitely recommend you pick one (spoilers: It's Illustrator). InDesign's specific purpose is laying out printed materials. That's its strength, you can see it as a way of joining Photoshop and Illustrator elements into a new 'thing'. However, where it shines is with multiple pages (tools like text wrap are extremely powerful). The good thing is: It packages fonts and images all in one file, but the file size will generally also tend to be bigger, so in your case, it might be a bit of an overkill. Yes, you could use InDesign, but you will be missing drawing features. Photoshop is best for creating and editing photos or raster images. Its main 'power' comes with its image manipulation possibilities. It is not made for printing. Think of it more as a way to edit pictures you want to then add into printing materials. So, you could use Photoshop, but then you'd have issues preparing the files for the printer. Illustrator is used for illustrations, logos, and scalable graphics in general. It's also widely used in printing, but not for multipage documents like InDesign, as it has no support for master pages and it doesn't let you automate page numbers. Illustrator's drawing capabilities are closer to Photoshop, but 'better' for non-raster illustrations. You can do anything you can in Photoshop - illustration-wise - and you will be able to get everything ready for production in no time. So, in short, I'd say most cards get designed in Illustrator. As Confused mentions, all printers will be happy with Illustrator files, there are plenty of examples you can follow and the result will just be, overall, better. Making a business card. Any advice? What DPI should be used for what situations? Okay, maybe not at that scale... but happy recurring clients coming back for bigger variants on work they liked (delighted by your super-fast turnaround times) can really help keep the wolf from the door. Any illustrative elements beyond simple lines and boxes in Illustrator then placed into the InDesign layout, since Illustrator's the best tool for that job. Icons, swooshes, decorations... Don't forget that InDesign's data merge can swap between image files including illustrator files based on a column in the source sheet if, say, you want different icons or logo variants for different departments. Any photographs or other necessary raster images prepared in Photoshop then placed into the InDesign layout, since Photoshop's the best tool for that job. Again these can be swapped around if needed by data merge. Variable text (names, job titles, email addresses) in a spreadsheet in the client's favourite spreadsheet package (usually Excel), which they update. This way, the person closest to that content is in charge of that content, it can be updated in the most efficient way by the person best placed to do the updating, and you can't be held liable for any typos in email addresses. Very important: from Excel, export the sheet as a UTF-16 text file (.txt) before feeding it to Data Merge. Don't use any of Excel's CSV options - they do awful things to non-ASCII characters (e.g. accents), and Łukasz Mączyński won't be impressed to get a business card where several letters in his name are replaced by junk. And be very careful if Arabic, Hebrew or any other right-to-left language is involved... This goes for anything involving Adobe software: Adobe simply isn't an internationally-minded company. It'll be fine in the UTF-16 text file, but Adobe might ruin it if the file isn't specially set up, and if you don't know the language, you might not notice, with terrible/hilarious results. You can change any illustration or photo in 1000s of business cards instantly. New logo means new cards for everyone in a 1000-strong company? No problem! 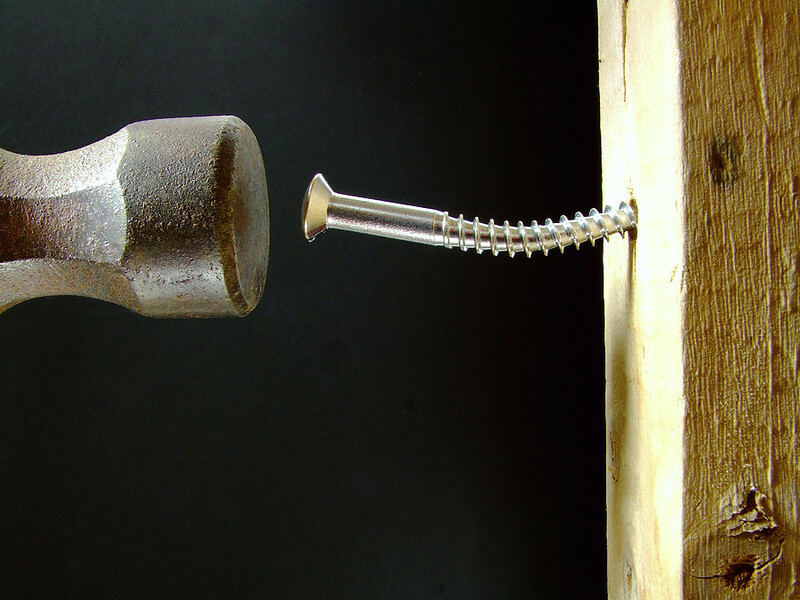 You're never trying to muddle through using a tool that's not the best tool for the job. Put down that InDesign pen tool, Illustrator paragraph styles panel and Photoshop text tool! The only complication is going File > Place a couple of times per template. You can produce perfect business cards for 1000s of people in minutes, and InDesign will tell you if any of the text for any individual doesn't fit. You don't need to touch the content if you don't want to, so there's almost no risk of typos that are your fault. Just make sure that it's written into the contract that you're not responsible for any typos in the content they send you! If they do want proof-reading, make sure it's in the contract and the bill. Don't be guided by personal preference like 'effects', 'not fun' and 'clunky interface'. They are not relevant. As a designer you should pick the right tool for the job. This is not only about business cards. But applies to all pre-press productions. Adobes big three have overlapping tool space. But all three have their own specialty. If your design requires images (pixels) use Ps if you need illustrations (vectors) use Ai. Layout (combining pixels, vectors, and text) use Id. Make them work together and get the best of each tool. Yes, they have overlap. Setting text can be done in all three. 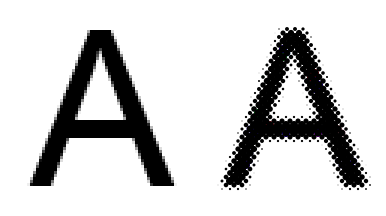 The thing that goes wrong with text (or any vector) in Ps is that they end up as pixels. The printer needs to rasterize those pixels to a screen (a pattern of dots). This process renders the edges fuzzy. You should have used vectors in Ai or Id. Because in those programs vectors are not converted to pixels but stay sharp lines between points. Note: There is a difference between designing and producing files for the printer. When you design, anything goes. I wouldn't use software but pen and paper. Use whatever you like. When producing the design for a printer, then the contents of the design dictates the software to use. All the business cards I create are done in Illustrator anymore. It simply offers more freedom. Of course, this only makes sense since Illustrator CS4 and the addition of the multiple artboards feature. Prior to CS4, I used Indesign (Or QuarkXpress) due to the overwhelming headache of needing one Illustrator file for each name on a card. That's simply not an issue anymore with multiple artboards (and symbols). That being stated, I will use Indesign if I need to configure a multi-impression run for cards, which I really don't anymore. I create one card so Illustrator is a natural choice for me. And I will use Photoshop for, well, photos or raster image requirements and link to the Photoshop file in Illustrator. About the only thing I can state I do not do is entire cards in only Photoshop. The only real important thing is that the card looks as wanted and it can be reproduced correctly. With that in mind, you could use "Jimmy's Playtime Paint Application for Kids" as long as it can save/export/output a proper PDF for reproduction. What you use is not nearly as important as how you use it. I'm actually surprised to see so much love for Illustrator in response to this question, but all the business cards I've done have been very sober corporate designs, so I guess the drawing tools weren't necessary. Our shop used InDesign exclusively for business cards, and wouldn't have dreamed of using IL or PS. ETA of course I should note that a company logo would be done in IL or PS, but that's because the logo would be used in multiple jobs, and so would always be artwork created outside InDesign. First, I would never use Photoshop for print works like that. Photoshop is a bitmap tool, and you'll ever have problems to deal with your printer. if you need to make same business cards for lot of people (changing the name, the phone, and so on), InDesign would be a better choice : you can do templating, work on multiple pages in one document. So it can be a good choice in that case. if you have to do beautiful (I mean : lot of graphic work) on a single business card, maybe Illustrator could be more efficient. Note that you can also do all the graphic job in Illustrator, and import it in InDesign to setup a template. Yisela answered the comparisons between the programs beautifully, but I would like to squeeze in an answer about workflow. I usually use both InDesign and either Photoshop or Illustrator. I do the design in Illustrator or Photoshop in the dimensions of the business card (i.e. 2" x 3.5" at 300dpi CMYK). Then I import that file into InDesign for layout. If the business card needs to be laid out 10 per page, this is as easy as copy/paste/arrange. Making changes with this workflow is SO much easier. Any change can be done in the original design file and updated from InDesigns’ Links window. If there is a period missing or something small, I just change it in the Photoshop or Illustrator document ONCE. If the entire design is scrapped and I need to come up with something different, I can still make that change in the original, or link and entirely separate file and replace all the iterations. Photoshop has terrible edge handling for the fonts and any other vector art you use or draw. But is great for effects. So don't use it. Indesign is creatively stunted, so not a lot of fun. Illustrator is almost ideal for this, but for its clunky interface and 20+ year old use conventions. And the Artboards are a great feature for iteration of your design. Use it over the others. All printers will by happy to receive your Illustrator file, and at the end of the day, that's the biggest determinant that should drive your choice for business cards. And you'll get clean, crisp, professional edges to all your artwork with it - VERY important for business cards. should I design in InDesign, Illustrator or Photoshop? Or you could use any other number of software products. What you need to understand is the type of software you as using and what it's designed for. PhotoShop is a raster based image editing tool. Meaning the files it outputs are a bunch of pixels. You can use it, but you'll typically use it for full color printing and/or cards with lots of photographic elements. Understand that because it is pixel based, for crisp type, you'll need to use relatively high resolution images. Illustrator is vector based. Meaning the files it outputs consist of lines. As such there is no resolution limitation--the text and imagery will be crisp at any size. Given that most business cards consist of vector logos and type, this is often the tool that is used. InDesign is a page layout tool. I can take images from the above and combine them into one document. You can then add text and as previously stated, you can go as far as using data merge tools. This makes it an ideal tool for large projects that require workflows. Which one should you use? Whichever one meets the needs of the particular business card project you are working on. I hate illustrator, but it is the correct tool for a business card. As most business cards are vector based with text and vector shapes/logos. It falls in Illustrators court, even though you could probably get the job done with either of the 3 programs. InDesign is better for multiple pages, image placement and anything where you don't need to draw vector shapes. I prefer InDesign for print ads as I'm usually slapping in a combination of text and photos/images. It is the best for laying out, resizing and placing elements on the page. Photoshop is better for non print work and obviously raster graphics. You could work with the shape tools, but it is not as good as Illustrator's vector tools. I'd personally recommend CorelDraw above all of these, actually. Far better vector handling, nicer toolset overall and a much more pleasant interface. I've been using Adobe products as well as Corel products for nearly fifteen years now, and I certainly know which I prefer to get real work done with - especially when going to print rather than for screen display. Not the answer you're looking for? Browse other questions tagged adobe-photoshop adobe-illustrator adobe-indesign print-design software-recommendation or ask your own question. How do I send a file I've created in InDesign to someone else, so they can open it up in InDesign and work with the file too? What can Illustrator do that Photoshop can't? Is it OK to use a smaller font size for credentials that come after someone's name on a business card? How to design a basic banner with GIMP? Which software is best to create banner/billboard? Should I use Illustrator or Photoshop for Collateral Design? PIxelated lines in illustrator… images are for print, should I worry? Which program should I use to design business cards, Illustrator or Photoshop?